No need for CAD software. VeryPDF AutoCAD to PDF Converter is designed to help you convert DWG to PDF, and DXF to PDF without AutoCAD. It provides a command line application as well as a GUI application. Both can help you quickly generate high quality vector PDF files from CAD drawings in batches. Run well in Microsoft Windows operating systems including Windows 98/ME/NT/2000/XP/2003/Vista/7/2008 of both 32 and 64-bit. Input formats - support a wide variety of versions of DWG and DXF file formats including R12, R13, R14, 2000 to 2004, etc. 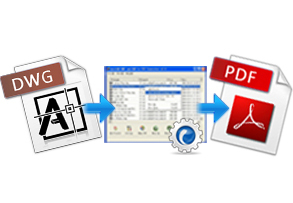 One-to-one - create an individual PDF file from a selected DWG file or create a single PDF files from a selected DXF file. 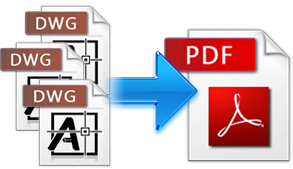 Many-to-one - in the case of batch conversion, convert several DWG files to a single merged PDF file or convert several DXF files to a single merged PDF file. Many-to-many - in the case of batch conversion, convert each DWG file or DXF file to a PDF file. Directory process - support single directory process and multi-level directory process ways. Monitor multiple directories - the computer can automatically convert newly added DWG files or DXF files in specified directories to PDF files, and export the result PDF files into specified directories. Support wildcard characters - in the case of batch conversion, wildcard characters like *.dwg or a*.dxf are supported. 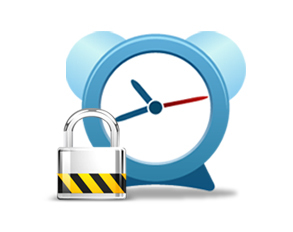 Allow you to set passwords for PDF files with 40 or 128-bit encryption. Help you to protect created PDF files by setting file permissions to restrict printing, copying, and future modifications. Allow you to set PDF description such as title, subject, author and keywords. Two applications - provide a command line application as well as a GUI application. Support drag and drop - you can directly drag DWG files or DXF files from Windows Explorer and drop them to the interface. Support sorting - In the case of batch conversion, you can sort the selected files according to file names, file paths, file sizes, or file types. View after conversion - after each conversion, the computer will open the result PDF automatically. Allow you to specify any resolution for the generated PDF files. Support more than 40 paper types.